Thank you for your interest in being an altar server! Altar servers assist the priest during Saturday and Sunday masses. Contact Fr. Ignacio Ortigas with any questions. Email or call 203-652-1151. Teen lectors proclaim the Word of God with understanding and clarity at the Sunday 5:00 Teen Mass. Contact Chris Otis at 203-652-1154 or email here. StAY Teen Choir & Praise Band is for high school students. The group sings at the 5:00 p.m. Sunday Teen Mass, accompanied by keyboard and guitars and rehearses at 4:15 before the Mass. Contact: Dr. John Michniewicz at 652-1180 or Dr.JohnM@starcc.com. High school teens serve as ushers at the 5:00 p.m. Teen Mass. Mass Captains (teams of adults and teens), coordinate teens that serve as ushers and gift bearers. 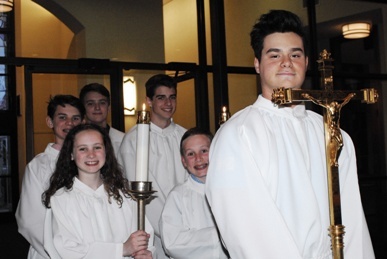 Contact Chris Otis, Director of Youth & Family Ministry, at 203-652-1154 or email here to get involved in the many roles that are available to our teens at the Teen Mass.